I have to admit that if I walked into the room above, having no history of Pilates whatsoever, I would be a little intimidated. You can’t help but notice all of the strange-looking contraptions with springs and straps dangling from metal poles. Interesting and mysterious, Pilates is unique not only because it restores balance throughout the whole body, but also because it lends to a full-body workout that is impossible to recreate elsewhere. One big obstacle, I think, when considering Pilates, is getting over the feeling of intimidation by the unknown pieces of equipment – and the fact that everyone else seems to be knowing exactly what they’re doing and moving in complete unison. Well – we’ve already addressed, in a previous post, the issue of moving at your own pace and knowing your own body, ( read more here ). In this post, I’m hoping to demystify the chains and whips that are kept in the corner at the studio – ha. just kidding – no chains or whips – but hopefully, after reading this, you will feel more comfortable with visiting Studio Be, signing up for a few classes, and testing out the apparatuses that will change your body forever. Something you may not have known…. One of the most common mistakes made by beginner Pilates students is calling the equipment “machines.” They are not machines—they are apparatuses. A machine can work by itself or it can work you. An apparatus needs a body to work with it in order to function properly and get the most out of a workout. Below is a rundown of the most common pieces of equipment you’ll find at Studio Be. The Reformer always seems to intimidate beginner Pilates students more than any other apparatus, which is probably due to its no-nonsense name promising to “reform” the body. Joseph Pilates called it his “Universal Reformer.” The Reformer is like a bed frame with a padded mat inside that can slide back and forth within the frame. Four springs are attached between the mat (called the carriage) and the frame to create resistance on back-and-forth movements, with the option to unhook or re-hook springs to add or subtract weight depending on the exercise and resistance desired. You might lie down on the carriage, and place your head on the headrest and feet on the footbar. Extending and bending the legs will slide the carriage back and forth, but this is just one way to move with the reformer. There are countless positions and ways to use the reformer, such as standing on it, lying on a box, sitting on a box, using the arms to move the carriage and laying on the side of the body. The Universal Reformer offers endless possibilities. The Cadillac is indeed very large and, like the Reformer, looks like a bed with a raised and padded mat, but has an additional elevated frame of metal poles above it. Attached to the poles are a series of springs, wooden bars, loops and fuzzy straps that allow for a wide range of exercise and stretching movements. Most fun of all is the Trapeze Bar hanging from above, which allows you to hang from the trapeze, do pull ups through the bars, or twist the body into fantastic stretches while up in the air. The Tower is very similar to the Cadillac, only smaller. It was originally created as a way to offer more students the opportunity to use the elements of the Cadillac in group classes without such large pieces of equipment all over the studio. The Tower is, in effect, a one-sided Cadillac with a lower bed (also called a mat). Tower classes can be found at just about any Pilates studio that offers equipment classes. As a student of Joe’s, exercising on his original Cadillac would have been a true test of endurance as the “mat” was not a mat at all, but a flat piece of wood. Not the most comfortable base to lie down on! However, he also went to the other extreme and had towers attached to actual beds. There are films and photos of Joe teaching on both the Cadillac and the Tower, which are quite beautiful to watch. The Chairs have a fascinating history behind them. 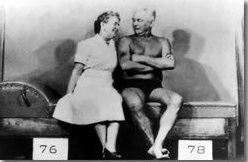 As part of his vision that everyone would have access to his exercise system in their own homes, Joseph Pilates created the Wunda Chair with the intention of it being a smaller version of the Reformer. In fact, the Chair is known as one of the first pieces of home exercise equipment ever made. Even more interestingly, his chair functions like an actual one that you could sit in when not exercising, making it a perfect space-saver! Today in a studio, students are able to do many Reformer exercises on the Chair, as well as exercises unique to the chair. It is typically one of the most challenging pieces of equipment because it’s small and is capable of using light spring resistance, which means less assistance and a greater challenge to the user. To the eye, the Chair appears to be a little square with a simple pedal and only two springs. Common exercises include one-armed push-ups and triceps dips, as well as using the deep abdominals to lift the pedal off the floor. The Barrels come in a number of sizes. The largest are called Ladder Barrels and are used for stretching and a handful of other exercises. Smaller barrels can be seen scattered around studios and are usually used in Tower classes as additional pieces of equipment. Then of course there is also the Spine Corrector—a medium-sized barrel with a foot on one side to allow for even more exercises. There is a story that Joe Pilates took an empty beer barrel, cut it in half, turned it round-side-up, elevated it and attached a small ladder, thereby creating the Ladder Barrel. He was truly a genius inventor. There are other, small pieces of equipment used in studios to either add extra challenge to an exercise or to create entirely new exercises in themselves. The Magic Circle, the Foot Corrector, the Ped-o-Pul, the Sand Bag Set and Push-up Bars were all invented by Joe Pilates as ways of creating balance and strength throughout the whole body. Pilates students who have the opportunity to use push-up bars are in for a treat—not only are they beautiful to look at, but they are also quite large and thus allow for a great range of motion in exercising. Interestingly, each of these additional pieces of equipment seems to isolate a particular body part at first glance. For example, the inner thighs squeeze the Magic Circle, the foot presses on the Foot Corrector and the arms move the springs of the Ped-o-Pul. However, that assumption could not be further from the truth: for each of these small pieces of equipment, the entire body must work incredibly hard and with deep focus in order to complete each movement properly. Joe Pilates invented hundreds of equipment pieces and furniture to bring whole-body fitness to everyone’s daily lives. I think everyone who takes Pilates – and instructs – probably has their favorite piece of equipment. Mine would have to be the reformer, I guess, because I love doing ‘Climb-A-Tree’, ‘Snake’, and ‘Teaser’ on the reformer, to name a few. What about you? What’s your favorite? Place your vote below. I’ll keep you posted on twitter as the results take form. Additional information and details about Joe’s visions and intentions, his original exercises, and photos of his equipment and furniture can be found in the two books he wrote, Return to Life Through Contrology, and Your Health. For even more information, and a firsthand experience with his amazing equipment and method, check out Studio Be today! Your body will thank you! !